and then use it for display notification on website. You could add extra data for notifications, exceptions etc. You could add stack for messages and other ways to manage messages. It is not a discovery, but when you do not know this it can be frustrating. If you notice that your buttons (h:commandButton or a4j:commandButton) do not response on first click, when you must click two time (double click) to perform an action, this may be a solution for you. The problem may be caused by form you rendered earlier than click or you rendered element that contains that form. In firebug or other development tool that records requests you can analyze this problem in POST parameters of the request. After form re-rendering first request on first click will not have javax.faces.ViewState parameter. second request on second click will have this parameter. This is how you can diagnose problem tiwh view state. Main cause of this problem is that h:form looses its view state (javax.faces.ViewState). You rendered it first time when page is loaded, and then you re-render this form when you clicked at “action” button, so it is not the same form “rendered” you wanted to react. Solution is to load all forms (h:form) once per page load. In other words you must render elements elements that is inside form. To solve example problem I just add h:pandelGroup inside form, and named it with form id. Do you develop web sites with jQuery? Do you follow official “$” for jQuery object? I do not. To avoid it I recommend to use full name “jQuery” excessively inside of plugins. If you are familiar with JS based UI you should remark that many of UI frameworks eg. jQueryUI or Dojo Toolkit has limited number of widgets to use out of the box. If you need standard UI elements like button, accordion, list, grid/table etc. you will find it ready to use in frameworks. Unfortunately most of enterprise web applications needs dedicated UI widget. Usually best way is to use existed widgets and create what is needed. It is easy to start, implement first events, first functionality, but after 200 lines of JS code it can be painful to maintain simple tasks. I will show you how I manage states and data in some of my jQuery widgets. This is not best way for official widgets, but it is best for simple widgets created for dedicated applications. Official, more convenient way using jQueryUI Widget were described on jQueryUI widget page. If you want to create official plugins you should check the official way. In this article I present only simple way for managing states and data of widget. Main idea is to not use functions for create widget. It is easy to write. You can manage one 1-5 methods like this, but not big widget. Do not write functions for widgets, use jQuery extensions instead. Did you notice that I separate list and row for two widget? I did it before in functions for code clean. But now it is important! Not only to keep code clean but to separate objects that will be created. Notice that I pass list instance to row. This way I will have reference to container in row. This is one of condition for element to separate as a widget, if you will need instance of other widget to use. Ok but what about parameters and default widget definition? In code above I pass object into widget definition, not only data that will be used. Why I did it this way? To open access to all configuration of widget.I recommend this even when you need only simple data, eg. text for row. This way you will have open code for changes, eg. to add different style, or different click handler in future. Let’s see what will happen after create myRow widget. Widget will check if this is first call and widget must be defined or widget must be redefine. For first call default definition is provided, otherwise previous definition is retrieved from data of it’s HTML element. I prefer to use jQuery.data every time when some data, functions or objects must be connected in some how with HTML elements. This way I never confused to calling object that I want to call. Object scope is very tricky in JavaSctipt. After getting new or retrieving old definition of widget, new definition param is used to extend it. This way you can pass new functions to handle click or other events or even creation of widget it self if you define those in def object. At the end definition is linked width HTML element. This part could be stored only at the widget creation, but this way is more readable. And this is it! Simplest way for widget data manage. Now you should add creation method and call it when widget is not defined, add events that are defined like below. Remember that, in sample above I pass function to event, so if you would like to change it after widget creation it must be defined in different way. Always try to separate even simplest part of widget like button, row of list, etc into dedicated widgets. It’s been a while from last post, last work on android games. Now it is time for .NET, let say small break. Finally I have got a finished my second game. This one is created without AndEngine. Most of UI is created in xml layout definition. Graphics is handled by classes that extends android.widget.Button. In those I override onDraw method to draw graphics elements for all click-able sprites. Game is another brain training game. You must collect specific amount of water in two tubes using simple steps : fill tube, pout into another tube and pour out. Since last days I was working hard on my next game and first application. 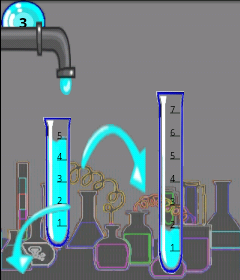 It is called “Chem-Quest”. I started working on this game 2 month ago, it was my first look on Android. There is no framework in this game. I combine XML layout and drawing on View’s Canvas. I want to say that it wasn’t simple to handle graphics as using framework, but I want to try this way. Most problems is how to scale on different displays. Still game is not best on smallest devices (less than 180×160). In this game graphics is more complex, almost beautiful I’d say 🙂 It was not created by me, but my friend. Still I need to spend some time to test all paths. I hope it will be published tomorrow or day after tomorrow. First application, but it is almost like game. Actually it is based on other game called “Remember Me: Balls” – this game needs days to finish. Application is called “Lotto-Blender”. It is a lottery randomiser or lottery number mixer. It is based on AndEngine and it was created in 3 days till now – yes only 3 days. Graphics is simple but I think quite nice, all created in Gimp using some filters. This is important application for me because I used AndEngine physics plugin for the first time. This plugin is a fast and free Android physics engine. It is based on JNI calls to Box2D engine. The great about this engine is simple way to attach this engine to your AndEngine code. Application is almost ready, but still I get some errors. I hope it will be published till Monday. In free time I was looking for good free engine for Android 3D games and I could not found any. There is two or tree that simplified some work, but no full game engine or engine that is in final release. Most advanced is JMonkeyEngine, but in alpha stage. Most stable is libgdx and jpc – but without 3D physics and all configuration is on developer side. So I decided to give up 3D games for now. My topic for next week is more advanced physics in 2D game, with joins, maybe skeleton physics, and some more advanced graphics. And again I want to use AndEngine. Did You heard that AndEngine creator is working now for some company called “Zynga”? It is looks that AndEngine become Zynga property, but it will stay an open source. GetJar no APK to download?